Some time ago I posted a Gentle Grammar Lesson, taken directly from Charlotte Mason’s writings, demonstrating how simple it can be to teach grammar to children using the books they are reading for history and science. In order to see this a little more completely, following is a week of grammar lessons. This week of lessons is taken from the Ancients Unit of our 4th Grade Daily Lesson Plans. (This is at the beginning of the school year.) Note that this method integrates grammar study with copy work, handwriting and even history and science. At this point, I assume your child understands that a sentence is a group of words combined to make a complete thought. If you haven’t taught that yet, here’s a lesson for that. A Hebrew woman gave birth to a son. Pharaoh’s daughter came down to the river to bathe. 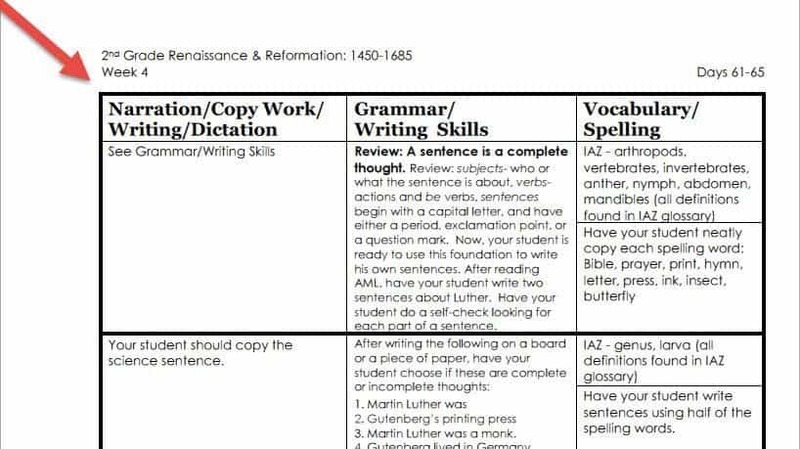 Review and have your student make any necessary corrections. Let’s talk further about sentences and use a new word – predicate: A complete sentence is made up of a subject and a predicate. A subject tells whom or what the sentence is about, while the predicate tells something about the subject. As you discuss this with your student, continue to reinforce the difference between the different functions of the subject and the predicate in a sentence. Look at other simple sentences and have your student come up with some on his own, and divide them into subject and predicate. Before the grammar lesson, as a copy work assignment, your student is asked to neatly copy the following taken from Mara, Daughter of the Nile by Eloise McGraw (another history book that does double-duty as a literature book). Doorways were blue-black in white buildings. Sweating porters hurried in and out. Remember yesterday when we talked about subjects and predicates? What do you remember from our discussion? A complete sentence is made up of a subject and a predicate. The subject tells whom or what the sentence is about, and the predicate tells something about the subject. Yesterday we divided three sentences from one of your history books into subjects and predicates. Let’s do that again. Where would you divide your three sentences from Mara, Daughter of the Nile? Have your student divide today’s copy work sentences into subjects and predicates. Check your student’s sentences with the provided answer key: 1. Doorways / were blue-black in white buildings. 2. Sweating porters / hurried in and out. 3. Nekonkh / chewed his lip. Matter is made up of molecules. Elements combine to make molecules. Properties are the signatures of elements and molecules. Altars were often built on the sites of important events. Ask your student to divide today’s copy work sentences into subjects and predicates. Have your student look for five basic sentences in today’s reading of Old Testament Days by Nancy Sanders (a history and activity book). Once five are located, have him copy them neatly. Now have your student divide them into subjects and predicates. Check and make sure they have been divided correctly. Have your student tell you what a subject and a predicate is. Have your student copy the writing/grammar rule for this week: A complete sentence is made up of a subject and a predicate. In addition, we suggest that space in a notebook be allotted for grammar rules. As with most new concepts, it’s useful to review the rules periodically. Want to see more examples of a week of grammar lessons? Why this method of teaching grammar, and language arts in general, works so well is that it’s so SIMPLE. Consequently, young students understand it! You teach one simple skill at a time, and one builds on another. It’s practical for you, too, since you don’t have to buy a separate language arts curriculum and take the time to teach it. Additionally, teaching language arts this way allows you to integrate it with your history and science reading, so it makes sense to your student because he’s already familiar with the books. So you are just adding new information (the language arts part), instead of trying to teach language arts “in isolation,” which isn’t as effective, in my experience. Does that make sense to you? Do you see the simplicity and practicality of teaching grammar like this? Do you think you could use this method to teach grammar? How might it simplify what you are doing now? What is the biggest challenge you have in teaching grammar to your kids?